See a full step-by-step below, and then let me know in the comments what little touches you put around the house to make visitors feel at home. Get even more centerpiece inspiration! I made this for our church alter last weekend. So beautiful and appreciated by many! Keep the easy arrangement ideas coming! So simple and pretty….love the yellow with the blue container…..as always….love it! We like using a teacup and saucer as a vase to hold a small bouquet of flowers that we secure real tight with a rubber band and place them in the teacup. 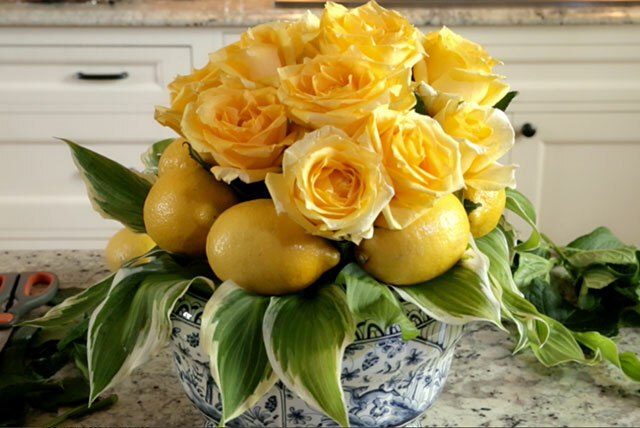 The lemons make your beautiful bouquet look so fresh! NOW I’m craving lemons…mmmmm I can smell them right now. Does anyone know how slices of lemon hold up in vases with flowers? Does the citrus affect the blooms? Gorgeous. Sometimes I just fill a bowl with lemons. The bright yellow and the citrusy smell is a very welcoming sight. My daughter says that she thinks of me every time she sees a lemon. Now here’s another way for me to use them. I have a lemon pitcher, lemon half tea light holder, framed lemon picture on the wall, etc. as a vignette in my kitchen. Sometimes I use my black fruit holder for lemons rather than apples. I look forward to your post each day. Thanks so much for sharing this way. Wonderful thank you for sharing-can’t wait to try this! guests and a small vase of flowers on the vanity in their bathroom. They always thank me for welcoming them that way. Thanks for this sharing this beautiful design! I am ready to shop for lemons and roses!! What a great idea, to put fruit in a flower arrangement! Never thought to do that. When someone comes to my home, to make them feel at home I usually have a little basket or tray on the bed they will be sleeping in. I will put a couple of their favorite teas, a special soap,their favorite candy if I know it or chocolate. Also a single rose on a bedside table. If it is a tray, I will put the same plus a teacup and latest issue of Victoria. What a beautiful arrangement! Stunning! Perfect for spring and summer. Very bright and cheery…would definitely set the nicest tone for a meal. 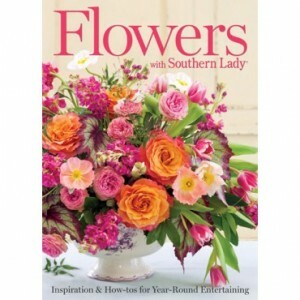 Love your flower and fruit arrangement! So fresh and sunny- love it with the blue container. Thank you! Beautiful arrangement! Will give it a try. Refreshingly….beautiful! Thanks for sharing this great bouquet. Clever and simple, thank you! Ultra easy and simply lovely ! Even I can arrange this floral design and adjust it to the seasons . Fruits and flowers together … nothing can be more perfect ! Love, love, love this! Thank you for the idea.